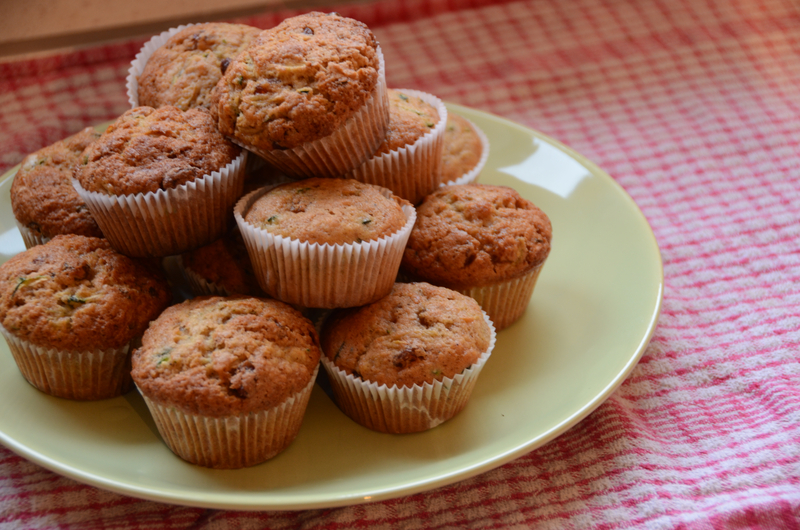 Now to Europeans I suspect the idea of eating sweet courgette muffins, probably sounds pretty odd. But I swear these are just delicious and very light. I’m not claiming any health benefits, but they could be worse! Rachel was a helper from Kentucky who stayed with us for 6 weeks last summer, who claims that I inspired her to learn to cook. Rachel is just about the kindest person alive, but I am still very flattered! She beautifully hand-sewed and designed the cushions at the beach house and created our Gîte Lily and Poppy sign at the end of the drive. This recipe came from her Mum, from whom I have learnt quite a few recipes, including Apple Butter, another unknown in Europe. Put the oven on at gas mark 5, 190°C. Mix together all the dry ingredients, add the wet, mix together roughly and spoon into muffin cases. Put in the oven for 25 minutes or until golden brown. Delicious. This entry was posted in Apples, Basse Normandie, Beach, cinamon, Festival, Food, Ginger, Holiday home, Moyon, Normandy, Property renovation, Rental, Single Mum by La Gourmande Normande. Bookmark the permalink.